A responsive web design, as the name suggests, responds to the type of browser and device used to visit them. Put simply, a responsive site can be viewed on a tablet, PC, smartphone, or laptop anywhere around the world. Now, you don’t have to build a site or special app for that matter, specifically for smart phone and tablet users, a well-designed responsive website quickly responds to any platform used to ensure a smooth user experience. Why is does this matter? It matters because IDC predicts the worldwide smart connected device market will attain a market value of $735.1B. Total PC’s will drop from 28.7% in 2013 to 13% in 2017. Tablets will increase from 11.8% in 2013 to 16.5% by 2017, and smartphones will increase from 59.5% to 70.5%. The following graphic shows the distribution of sales by platform. Responsive websites offer a single site accessible to all. They also offer other benefits to enhance the user experience. Help your brand stand out. 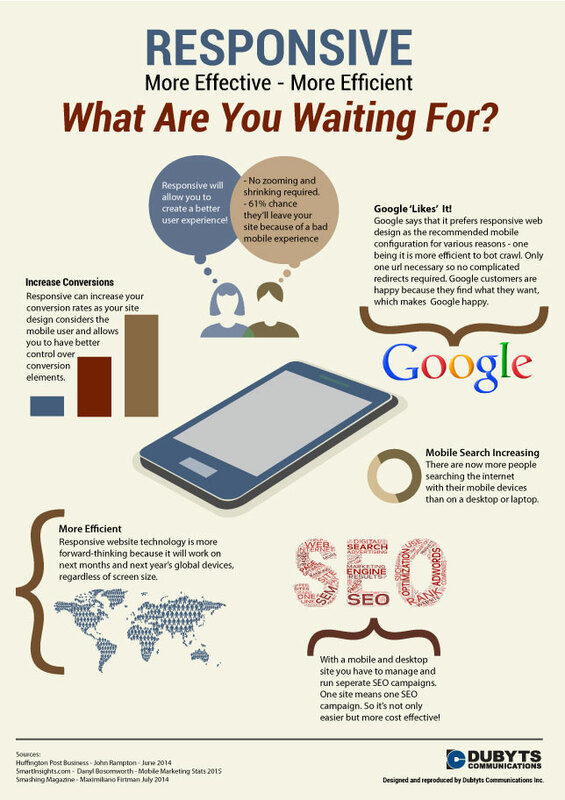 Since less than 2 percent of all websites are optimized for mobile devices, investing in responsive web design will help your brand stand out. Higher visibility in search engines. Because you’re dealing with only one site, you can spend time optimizing it for better organic search. It will be easier to keep up-to-date and since content is king in SEO, you can focus on building content for your single site. User satisfaction. Since all the information is available on your responsive website, users won’t get frustrated because a mobile only site contains limited information. All info is available from one source, 24-7. Lower costs. Updating and maintaining two sites is more costly than for one. So, while your initial investment in the development of a responsive site may be more, you will quickly see the efficiencies of maintaining one site. Superior analytics. With only one site to keep track of, your analytics and reporting will be easier read and analyze. You also have less conversion paths and funnels. Instead of having to redirect traffic, you will keep users on the same site regardless of their device! Protection from SEO penalties. Duplicate content can hurt search engine rankings. With a single site through responsive web design, you don’t have to worry about duplicate or unique content for your brand! 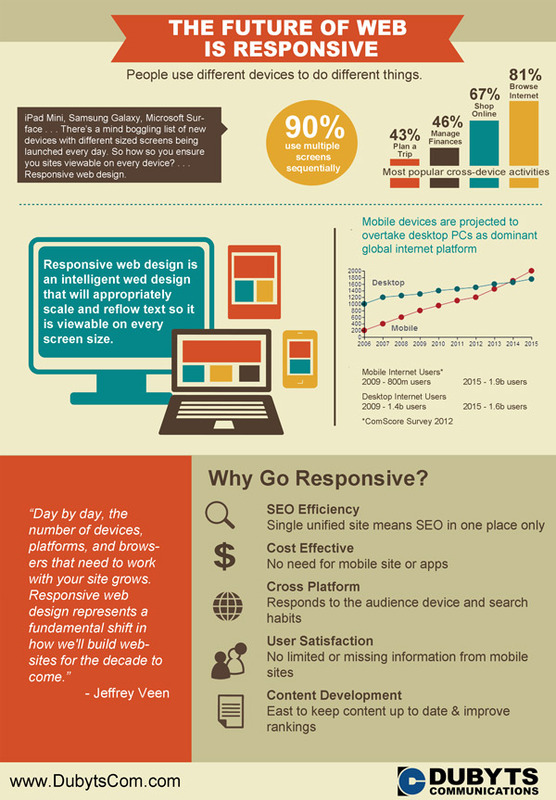 Here’s what a responsive website might look like on various devices.